The attachment of the word “saga” to protracted football transfers is an odd twist of language. The word’s origin is in ancient tales from northern Europe of mortal heroes struggling against the elements, the enemy and the odds to become “worthy men”. The settings and plots can vary but one constant remains; the central character is always relatable, human, one of us. The modern transfer saga is pretty much the opposite of that. About a week ago a Nigerian rapper known as “The Don” sent a tweet welcoming Arturo Vidal to Manchester United. Within seconds some Manchester United fans had jumped on the story. Within minutes they were certain he had performed at Vidal’s sister’s wedding. Within the hour many were convinced a new glory age had dawned and that United might as well be handed the Premier League trophy to save time. The successor to Roy Keane was finally at hand, the missing piece of a jigsaw (and it would seem to many United fan’s piece of mind) was in place. Nothing happened of course. Just another twist. A transfer saga, much like the universe and the atoms that comprise it is made up almost entirely of empty space. Fans do their best to fill that space. Absences from promotional photos are noted with excitement. Ambiguous statements by clubs, players or agents are picked over and pulled apart until they have even less meaning than they had to begin with. Old quotes from the player are dug up, sometimes turning out to be fabricated expressions a life-long ambition to join the club of their boyhood heroes. It is for the most part an undignified mess. What is the substance? The matter between the space? Well that’s what we as fans like to ignore. It’s unbearably complicated and dull. Today, transfers at the top end of the market are accompanied by negotiations which rival those which preceded the handover of Hong Kong to China. To the fan a player may be an idol, to a club they are a depreciating or appreciating asset to be exploited, always with a price. To a club, for example, Andy Carroll is an asset equal in value roughly to a medium sized oil tanker, rust covered and out-dated but still capable of doing a job. Each new owner tries to balance extracting value from its limited functions with the risk of being the one left holding the registration when the hull finally breaches. Fans of course don’t want to hear this. Their club should just get on with it. Pay what they have to, do what’s required to get their man. The transfer window offers terrible hope. Past mistakes can be atoned for. Last season’s woes forgotten. Everything is possible and anticipation builds. This year’s signings are slowly unveiled like the cash amounts on a scratch card. Each one promising much and who’s to say they won’t deliver. We haven’t finished scratching yet. We still might win. It’s compulsive and delusional in equal measure. 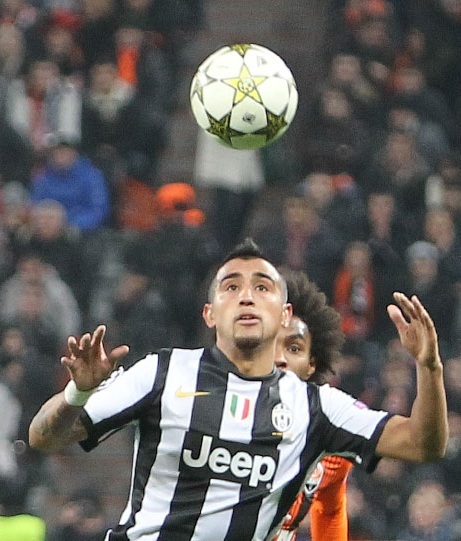 Arturo Vidal will it seems stay in Turin. His potential transfer (if it ever had substance at all) was likely an unknowable maze of go-betweens, accountants, insurance companies and agents. He was for the duration of the “saga” much like Schrodinger’s cat. It’s possible for fans on both sides of the affair to believe he might be theirs right up until any possibility of the deal is put to bed. This lack of certainty fuels an entire cottage industry of speculation, and I am as willing a customer as anyone. I wish Nigerian rappers represented the most spurious of rumours my illness has allowed me to entertain. For fans each day of a “saga” begins the same. A whistle stop tour of websites for summaries of the morning papers. A twitter trawl through “In the Know” accounts (the morally corrupt cold-reading psychics of the scene). A moment of profound self-loathing. Repeat. All day. All summer. At the centre of these sagas is a man who may or may not be looking for a new job. Inexplicably his employment situation becomes a spectator sport which rivals the action on the pitch. Amidst this labyrinth toil decent journalists like Graham Hunter, Gabriele Marcotti and Miguel Delany manfully trying to part the fog. They work with real life corporeal contacts to help feed the transfer zombie horde with meat rather than myth. In return they are often abused and heckled by the same horde should their hard-won stories jar with the dreams of the fans who read them. Occasionally they commit the cardinal sin of shedding light on a possible transfer which for one reason or another doesn’t come to fruition. The appertaining rage which greets such errors is comparable to what follows if a small child is bought an ice-cream only to have gravity and temperature team up to tear his world apart. At this time of year some fans don’t want the truth, they want the big rock candy mountain (Marco Reus to his friends). Transfer sagas should be a symbol of how far from the ordinary fans life experience the game has become. Instead through a sort of sleight of hand they become just another way for some fans to express their undying devotion and support their clubs ambitions. They only give out so many trophies each year but winning the transfer market is conveniently in the eye of the beholder. The sagas of Northern Europe had relatable heroes fighting epic battles to prove their manhood. Today, somewhere Ed Woodward, United’s cherubic Vice Chairman is on a conference call. This morning he closed a deal for a new toothpaste partner in Singapore but now he’s locked in a battle to sign the next super-tanker, begin the next saga . “What we do in life” thinks Ed, channelling his favourite film “echoes in eternity”. The Dan Petrescu of football writing: limited flair but reliable. Hint of pathos. Sad eyes. The young Irish – should they stay or should they go?